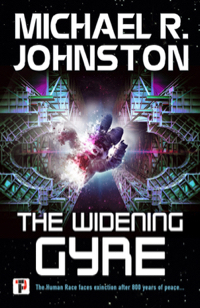 Today, we’re continuing the series with a conversation with Michael R. Johnston, author of THE WIDENING GYRE, a work of science fiction releasing from Flame Tree Press on March 14th, 2019. Once a war hero of the Zhen Empire, Tajen Hunt has become a freelance starship pilot, scrabbling for a living on the fringes of the Empire. When his estranged brother is murdered, Tajen discovers that he was killed by Imperial agents. Betrayed by the Empire he used to serve, Tajen gathers a crew and sets out to finish his brother’s quest—to find the long-lost human homeworld, Earth. What they discover will shatter 800 years of peace in the Empire, and start a war that could be the end of the human race. Then I remembered Chinua Achebe’s book of that name, and I decided to change it to The Widening Gyre. Some friends didn’t like it, and I let myself be talked into changing it yet again. But then my editor, Don D’Auria, said he preferred The Widening Gyre, and since I did, too, I happily changed it back. I began writing it in July 2012, began really taking it seriously after I attended the Viable Paradise SFF writing workshop in October of 2013, and finished the first draft in July 2015. I did some rewriting, and started submitting it to various agents & publishers in January 2016. 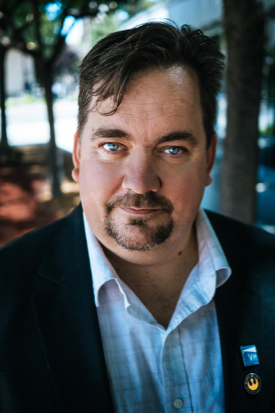 I got the acceptance from my publisher in May 2018. I did a lot of reading on Irish history, as well as researching the dismantling of the British Empire. There was an extended “dream” sequence in which Tajen had a conversation with an AI, unaware of what it truly was. But it wasn’t working, and as written it blurred too many lines, so I took the AI out and replaced it with a simpler scene. I’m much more of a plotter. Maybe it’s my English teacher training, but I can’t get traction on the story until I first work out the characters, and then outline the basic plot. I still get a lot of ideas to add in as I’m writing, and some things change in the process, but I definitely plan the shape of the story before I begin drafting. I like the point where I’ve nailed down the plot, I know what’s going to happen, and I can just write. Getting the outline done. Making sure that the plotlines not only make sense, but are interesting. I still have a day job as a high school teacher, and a child in grade school, so I have to write when it fits. During the school year, I try to write every night for at least an hour after my daughter goes to bed. During breaks from school, I write throughout the day--most of the work on The Widening Gyre was done during the summers. That said, I am working on ways to increase writing time, such as giving up some of the television I used to watch, among other things. I am working on a couple of things. First up is the sequel to The Widening Gyre, titled The Blood-Dimmed Tide. I’m also working on the plot outline for a new IP, another space opera set in a place I’m calling the Boundless Empire. And finally, I’ve got an epic fantasy that I’d outlined, but which I took back to the drawing board to replot, because I love the characters and the basic idea, but a lot of my original outline doesn’t work.